We are a leading Wholesale Supplier of rabeprazole and levosulpride, cholecalciferol 60000 iu capsule, multivitamin multimineral antioxidant capsule, omega 3 fatty acids multivitamin soft gelatin capsules, esomeprazole and domperidone capsules and rabeprazole and domperidone sustained release capsule from Chandigarh, India. 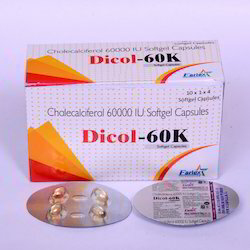 Cholecalciferol 60000 IU, especially used to prevent or treat different conditions of the bones or skin caused by the lack of vitamin D. Cholecalciferol 60000 IU is a fat-soluble vitamin that allows your body to absorb phosphorus and calcium. 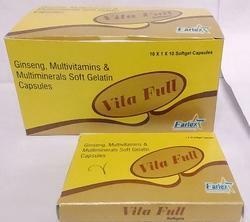 This soft gel capsule can also be used in kidney diseases to keep blood calcium levels normal and helps normal bone growth to occur. This ingredient is mainly given to breastfed infants as the breast milk, generally has low vitamin D levels. 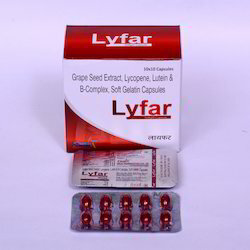 If you have ever had any condition that makes tough for your body to absorb nutrients from food or had an allergic reaction to vitamin D or had high levels of vitamin D or calcium in your blood, then you should not use this capsule without consulting your pharmacist as it may cause life-threatening side effects. The dosage, basically depends on the age, medical condition, diet, amount of sun exposure and response to treatment, so avoid taking this capsule unless your doctor has prescribed you. Supplementing the diet to treat or prevent vitamin deficiency. It may also be used for other conditions as determined by your doctor. 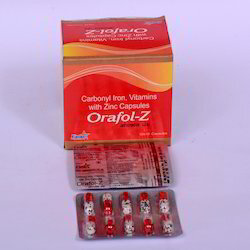 Folic acid/cyanocobalamin is a vitamin combination. 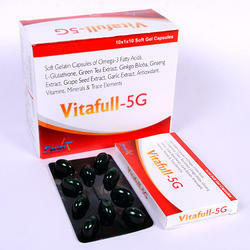 It works by increasing the amounts of folic acid and cyanocobalamin (vitamin B12) in the body. 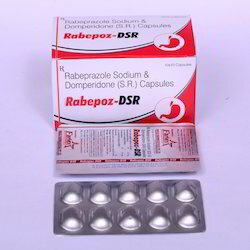 Esomeprazole is used to treat gastroesophageal reflux disease (GERD), a condition in which backward flow of acid from the stomach causes heartburn and possible injury of the esophagus (the tube between the throat and stomach). 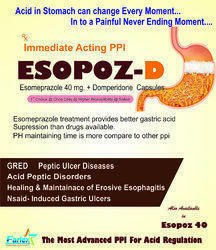 Esomeprazole is used to treat the symptoms of GERD, allow the esophagus to heal, and prevent further damage to the esophagus. Esomeprazole is also used to decrease the chance that people who are taking nonsteroidal anti-inflammatory drugs (NSAIDs) will develop ulcers (sores in the lining of the stomach or intestine). It is also used with other medications to treat and prevent the return of stomach ulcers caused by a certain type of bacteria (H. pylori). Esomeprazole is also used to treat conditions in which the stomach produces too much acid such as Zollinger-Ellison syndrome. Esomeprazole is in a class of medications called proton pump inhibitors. It works by decreasing the amount of acid made in the stomach. 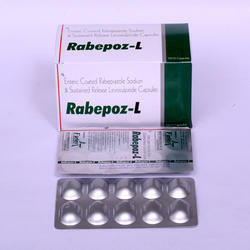 We offer our clients the qualitative range of Rabeprazole and Domperidone Sustained Release Capsule. 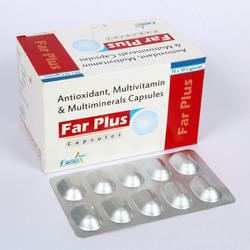 Our offered capsules are widely admired among our renowned patrons for their accurate composition and long shelf life. Procured from authentic vendors, the provided capsules are well-processed under the surveillance skilful professionals using quality assured chemical compounds with the aid of innovative methodology. 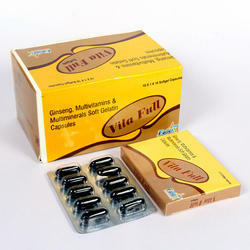 We are offering these capsules in safe packaging options at affordable price. 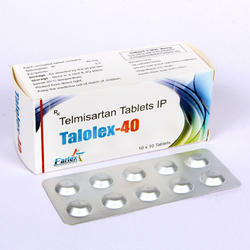 Take with a full glass of water (8 ounces or 240 milliliters) unless your doctor directs you otherwise. Do not lie down for 10 minutes after taking this medication. Ginseng (/dns/) is any one of the 11 species of slow-growing perennial plants with fleshy roots, belonging to the genus Panax of the family Araliaceae. Ginseng is found in North America and in eastern Asia (mostly northeast China, Korea, Bhutan, eastern Siberia), typically in cooler climates. Panax vietnamensis, discovered in Vietnam, is the southernmost ginseng known. This article focuses on the species of the series Panax, which are the species claimed to be adaptogens, principally Panax ginseng and P. quinquefolius. Ginseng is characterized by the presence of ginsenosides and gintonin. What are the health benefits of lycopene?A number of studies suggest that lycopene may have antioxidant benefits. These effects are believed to help prevent asthma caused by exercise, although the method is still unclear. Early studies also report that tomato-rich diets may benefit people with asthma. 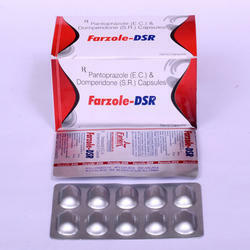 Pantoprazole with Domperidone is used to reduce the amount of acid produced by the stomach, to treat or prevent conditions such as heartburn, Gastritis, ulcers and GERD. For best results, it should be taken just before a meal. It can help with the greater amount of stomach acid that is always produced. Ginseng which has popent immunomodulating properties that is they help in regulating or normalising immune system. Ginseng is believed to restore and enhance normal well-being and has become one of the most popular herbal remedies in the world today. Ginseng is a good source of energy provider and may help with stimulating physical and mental activity among people who are weak and tired. Ginseng may improve thinking ability, cognition, behavior and quality of life, improves Brain Function, mood and reduces Stress. Ginseng has potent anti-inflammatory properties targeting different levels of immunological activity. Ginseng is used to treat dysfunction, improves lung function, lowers blood sugar levels, boosts immune system and helps with weight loss. Ginseng has shown evidence in treatment and prevention of influenza (Flu) and respiratory syncytial virus (RSV). Ginseng has substances and chemical that has anticancer properties. as here may be substances in ginseng.Presence of other multivitamins and minerals improves overall body functioning, boosts body metabolism and also enhance immune system.